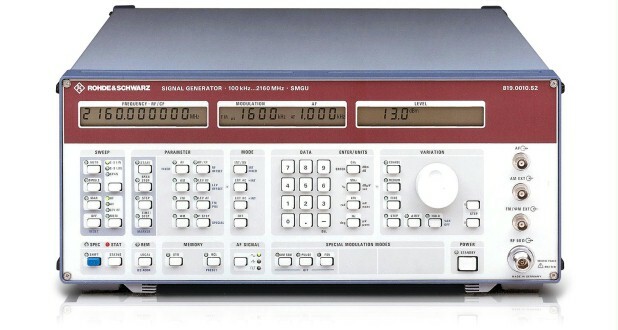 R&S®SMGU and R&S®SMHU are ideal for applications which the majority of signal generators cannot handle. In addition to out-of-channel measurements, they are for instance able to determine the spurious rejection of radiotelephone equipment up to 4 GHz as laid down by CEPT. The frequency can be set with a resolution of 0.1 Hz over the entire range, and this is sufficient even for measurements on extremely narrowband DUTs. Both instruments supply frequencies down to 1 kHz. The frequency can be set with a resolution of 0.1 Hz over the entire range, and this is sufficient even for measurements on extremely narrowband DUTs. Both instruments supply frequencies down to 1 kHz. The frequency setting time is below 10 ms. In the fast mode up to 200 user-defined frequencies can be handled by means of a trigger signal or by memory sweep in less than 1 ms per setting. R&S®SMGU/SMHU fulfill requirements for selectivity measurements on top-class receivers. Signals of extremely high spectral purity afford critical adjacent-channel, in-channel and out-of-channel measurements with a wide tolerance margin. Phase noise remains low right up to the carrier. R&S®SMGU/SMHU are therefore ideal for LO applications or as a low-noise reference in noise measurement systems. The FM modulation frequency range extends from DC to 1 MHz. In FM DC mode a high carrier-frequency accuracy is attained. The frequency offset occurring with FM DC selected is extremely small. The whole of the modulation frequency range can be used down to carrier frequencies of less than 100 kHz. The minimal phase shift at 30 Hz (AM DC) and a flat frequency response make for the precision amplitude modulation that is required for testing VOR/ILS navigation receivers. Rise/fall times of 20 ns (typ. <10 ns for frequencies >200 MHz) and an on/off ratio of 80 dB open up a wide range of possibilities for testing telemetry, microwave link, radar and satellite communications systems. In addition to the digital, step-by-step sweep with presettable start and stop frequency, span, step width and step time, an analog frequency and level sweep is also provided. The phase of the RF output signal can be varied in steps of 1 using keyboard entry or the spinwheel. This makes it easier to adjust for phase quadrature during noise measurements and to investigate phase-critical components.